The first large-scale USB charging solutions for demanding institutional applications: iPads, tablets, iPods, other USB devices. More and more organizations are deploying USB devices for institutional applications and the ability to keep them charged is a real challenge. Dozens of wires, AC adapters and power charging strips are often too cumbersome to organize or take up too much space. Cheap consumer USB hubs and chargers rarely deliver the power needed for large-scale charging and are not designed for durable, reliable institutional use. We even have the first universal USB charger, the DS-C-U8. Cambrionix is the industry leader in industrial USB hubs and innovative USB sync and charge solutions. If you would like information on our Apple iPad Sync and Charge carts and cabinets, visit our www.ipadcarts.com. For solutions to charge and secure laptops, netbooks and tablets, visit www.pc-security.com. See below or contact us for more detail on our industrial USB charging hubs. Datamation Systems is also happy to work with OEMs and special applications, providing USB charging components to qualified customers. 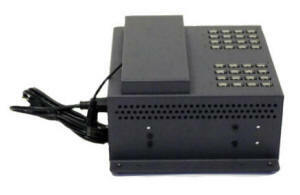 The DS-IP-SC-49 is designed as a 49 port USB hub for syncing but it will also charge iPods and some other USB devices. The DS-C-U8 is the first universal charger for optimal charging of any USB-chargeable device. 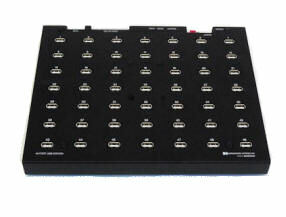 16-port universal charger coming soon. The DS-CH-32-500 provides stand-alone desktop charging for most USB devices in a durable, professional station. The DS-IP-PP16 is designed to provide quick-charging capabilities for up to 16 devices (iPads, iPods, iPhones, etc.) at Apple's optimum charge specifications. The DS-IP-32SC sync charger provides 2.1 amps to each USB port in a remarkably compact unit. Copyright � 2015 Datamation Systems, Inc. - All rights reserved.